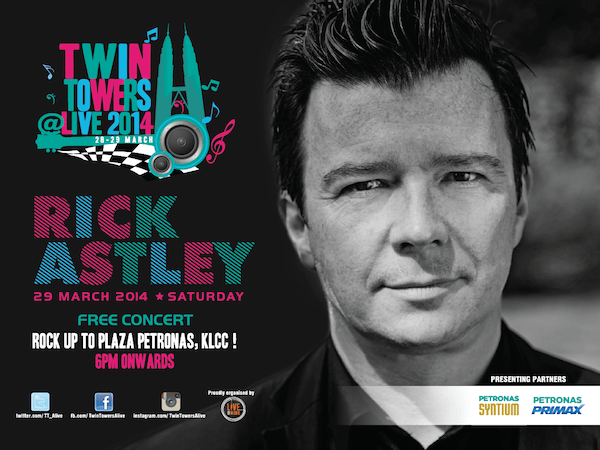 Rick Astley, the 80s singing sensation is set to ignite the stage at the Twin Towers @Live 2014 come 28th & 29th March 2014 as he performs live in front of his die-hard fans at Plaza PETRONAS. Rick Astley is the fourth artiste announced after Christina Aguilera alongside K-Pop sensation, Rain and British R&B singer, Craig David. Sharing the stage with these international stars are talented Malaysian artiste; Joe Flizzow,Altimet, SonaOne, Ila Damia, DJ Biggie and the up and coming band, OhChentaku and Irama. Exploding on to the music scene in 1987, Rick Astley’s took the music industry by storm in an era of pop disco music. Following the release of his debut single “Never Gonna Give You Up”, the 21 year old became a sensation overnight. Within 2 weeks of its release, the single reached Number 1 in the UK for 5 weeks and went on to hit Number 1 in 16 other countries worldwide. Today, he still holds the record of being the only male solo artist to have his first 8 singles reach the Top Ten in the UK.